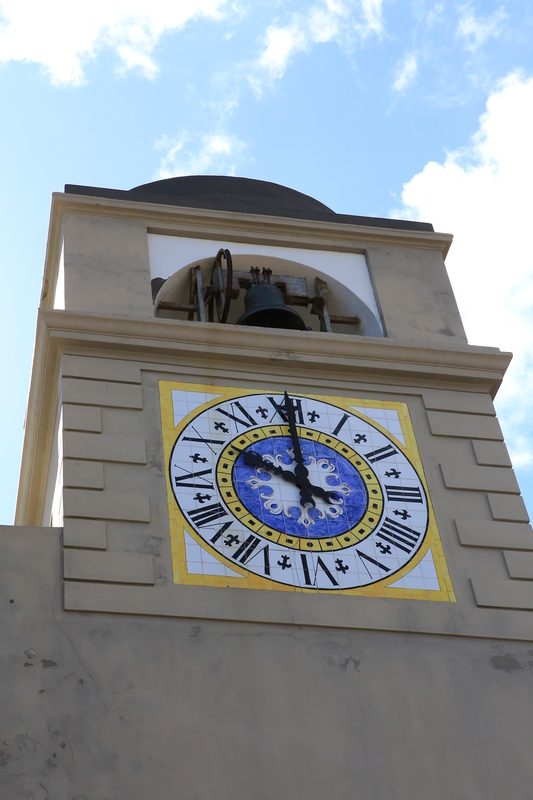 So we are on the Island of Capri and in the city of Capri. It is beautiful here. Most streets are pedestrian walkways but watch for hotel golf carts and scooters. There are many places to eat here and small stores where you can buy things to take back to your hotel. A bottle wine, some olives, fresh tomatoes, artichokes and of course great bread. Spread them out on a table top and you have a party. We stayed in villa Brunella, a wonderful hotel. The pool is great with fantastic views and a snack bar. There is also a restaurant on the top-level near the entrance. You will descend and climb many steps. The best rooms and most expensive are near the restaurant at the top levels. Each room (suit) is on its own level and has a living area, bedroom area and large bath with both a tub and shower. The bedroom is raised a step from the living room and faces sliding doors onto the terrace. You have a splendid view from the bedroom, living area and terrace. 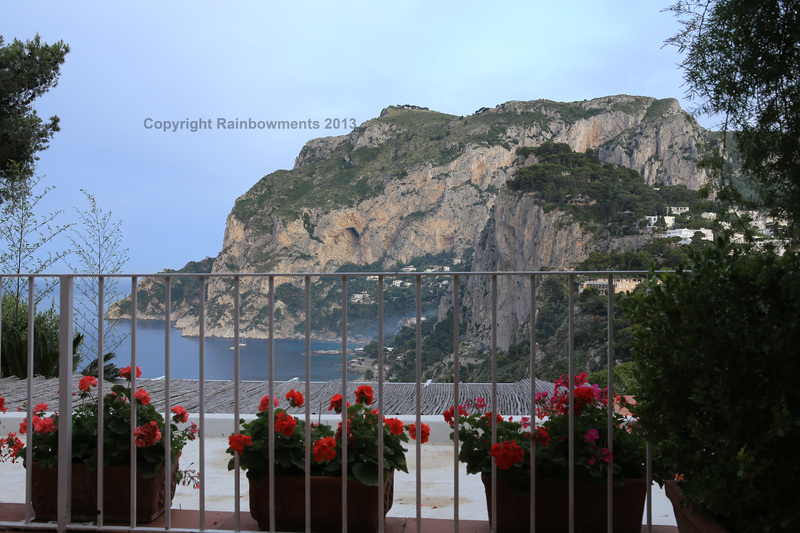 Imagine waking up in Capri with this view and breakfast sent to the room. Romantic and beautiful. 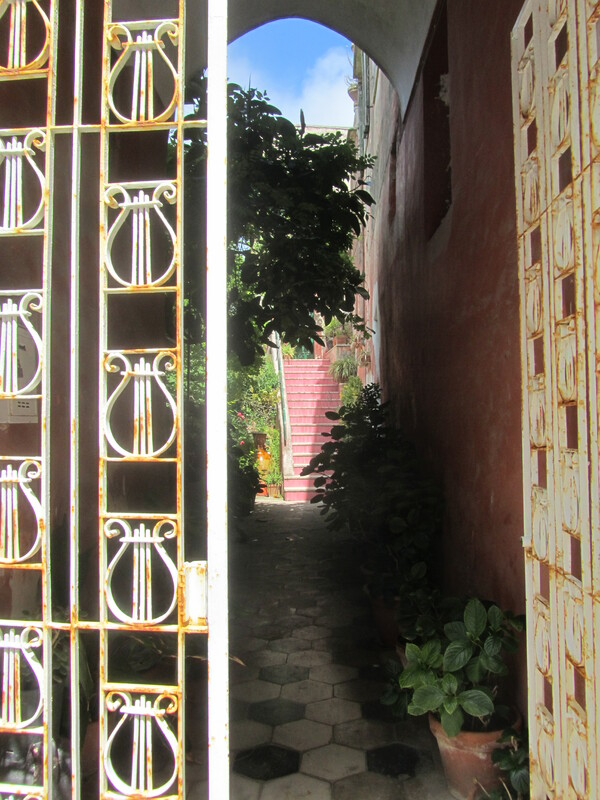 Breakfast is important because you will climb stairs and walk a lot to see this wonderful small city. 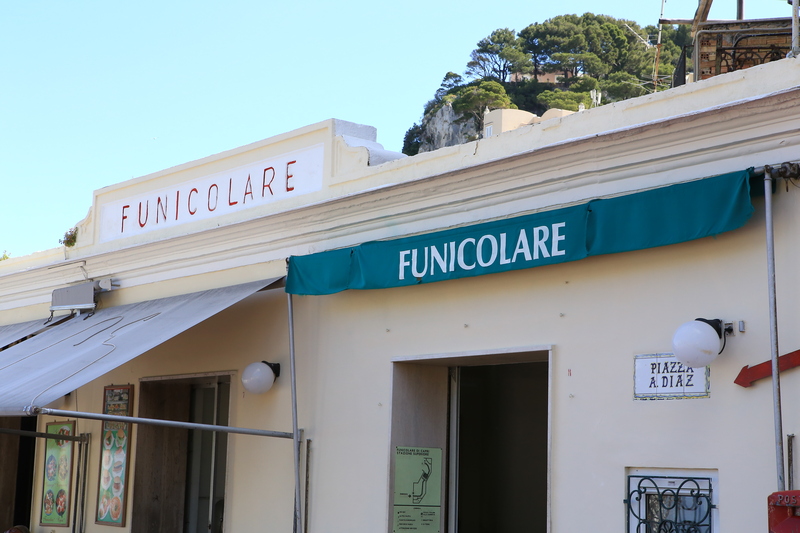 A short hike back to the funicular places you in the middle of restaurants, bars, gelato stores and many designer shops. Things are not cheep here, after all this is Capri. From the hotel if you go right to the end of the road, you get a fantastic view of Faraglioni Rock. 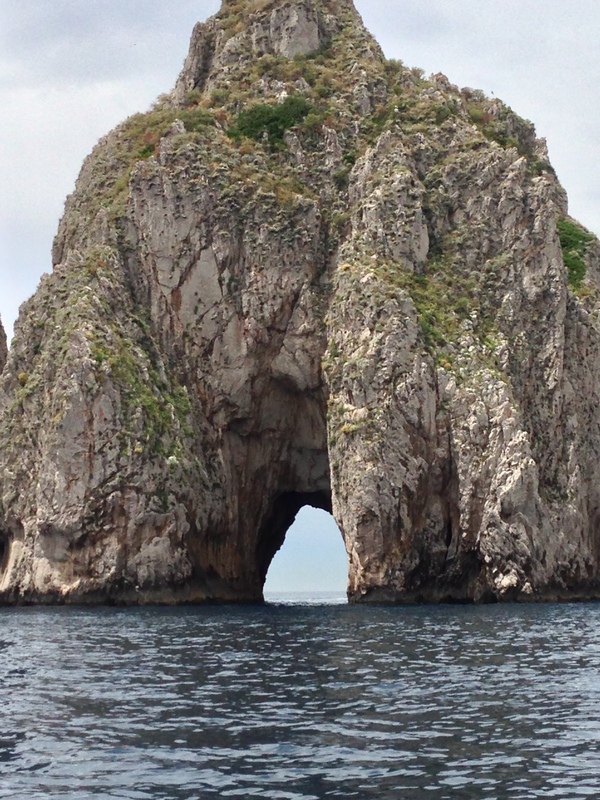 This famous tourist attractions allows you to take a boat through a hole in the rock. From one side it looks like a giant gorilla. There are many many steps down to the sea. There are two restaurants at the bottom and a place to get a private boat (order from the hotel first). The boat will take you around the Island and to the Blue Grotto if you want. Enjoy a night or two in this wonderful city. 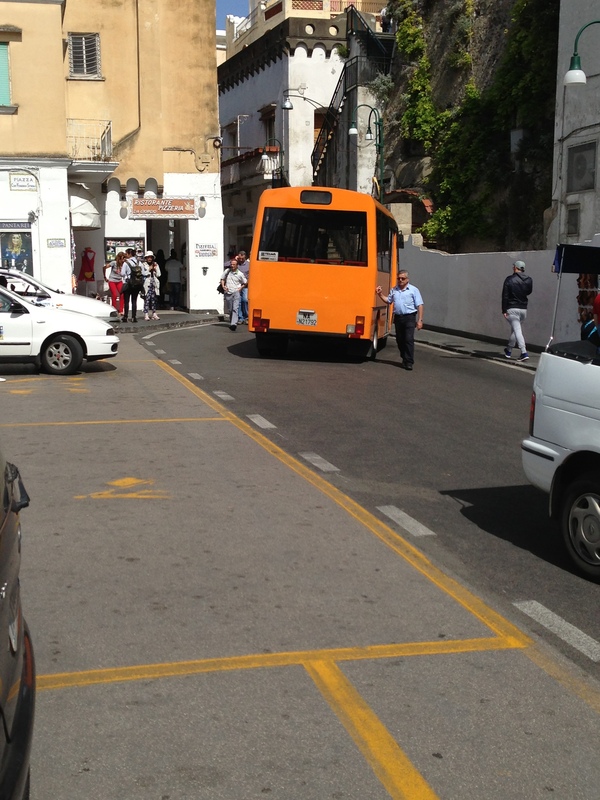 See Capri after the tourists have left on their ferries. It is magical! 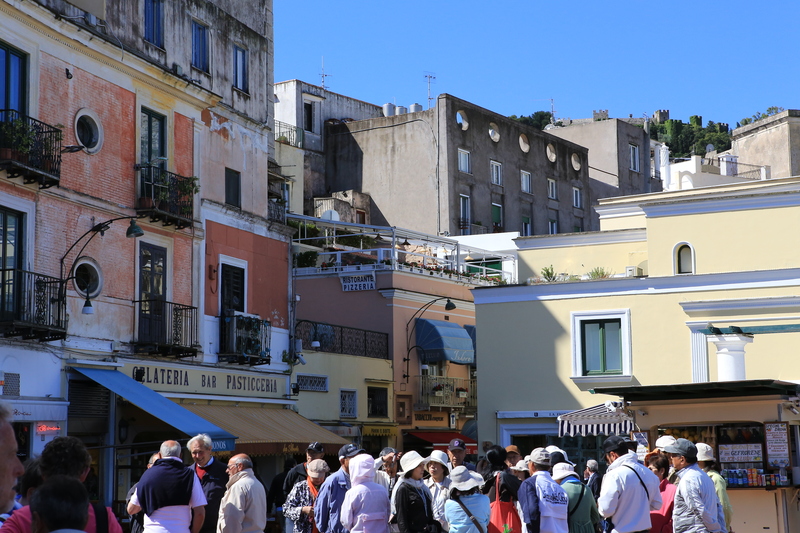 My next BLOG takes us to the other city on Capri Isle, AnaCapri. 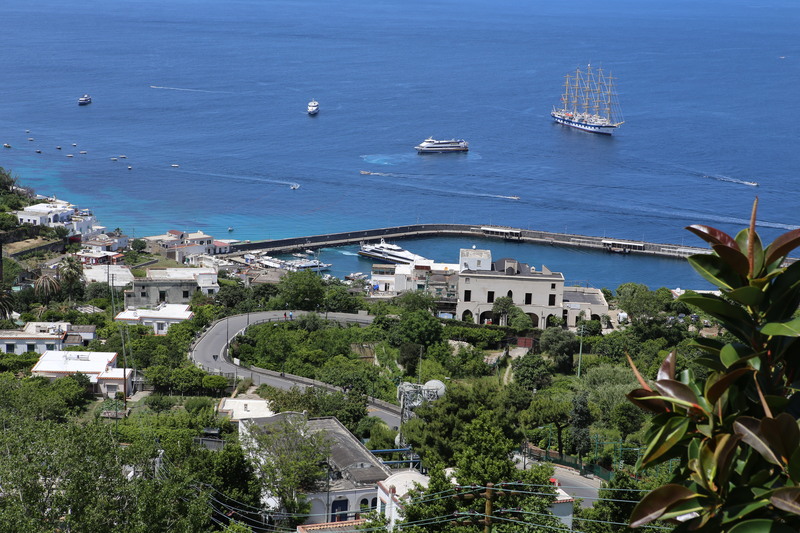 The ferries come into the large seaport below Capri. 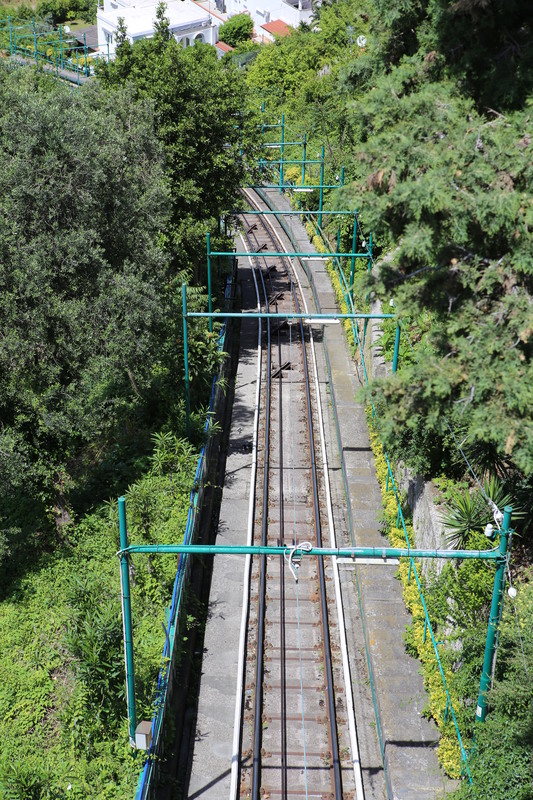 You can take a bus up to the main square or the funicular. Capri is romantic and beautiful. Spend at least one night there as the locals come out after the day tourists leave. Capri is a magical Island. 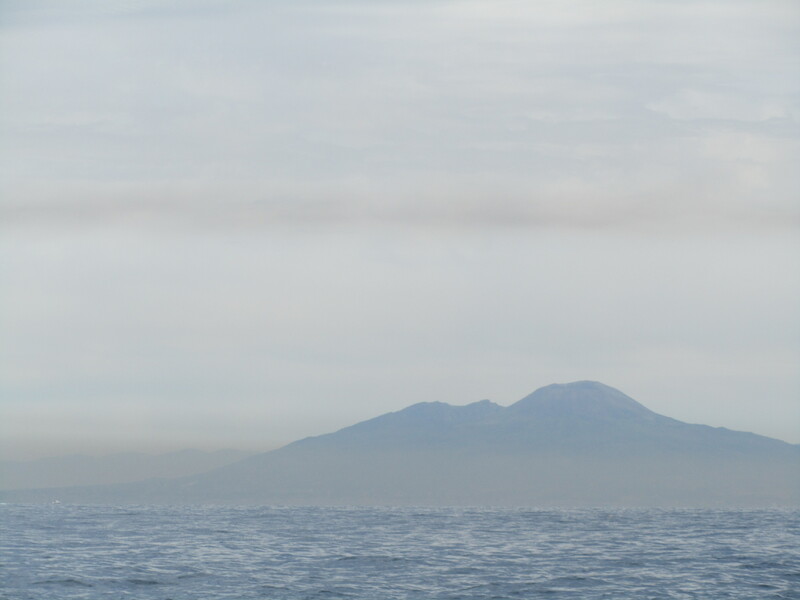 Most people take a ferry just for the day. If you do this, you miss out on the real magic! 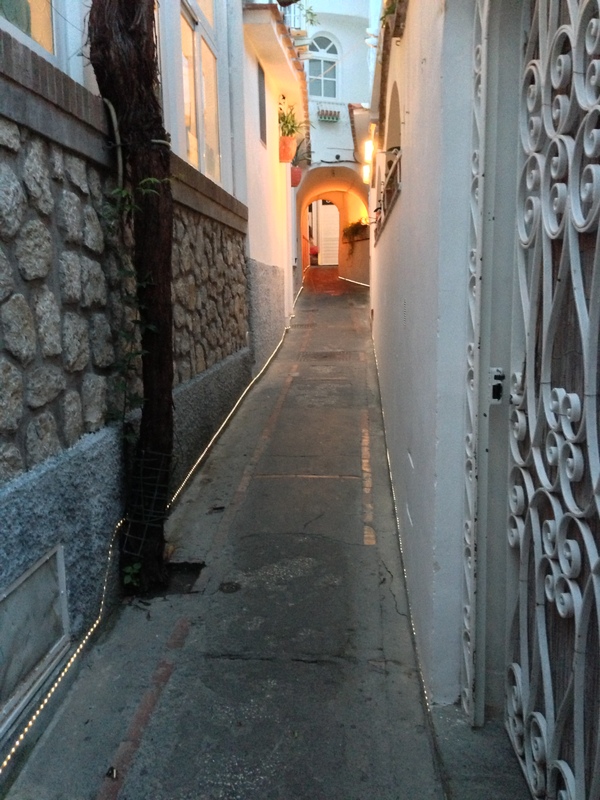 Capri comes alive in the evening when most of the tourists are gone. Those that remain and the locals walk the streets and have dinner in fantastic restaurants. Don’t miss the magic. Stay at least one night. If you want your hotel to be magical as well, stay at Villa Brunella. Villa Brunella is truly a magical hotel on the island of Capri, Italy. 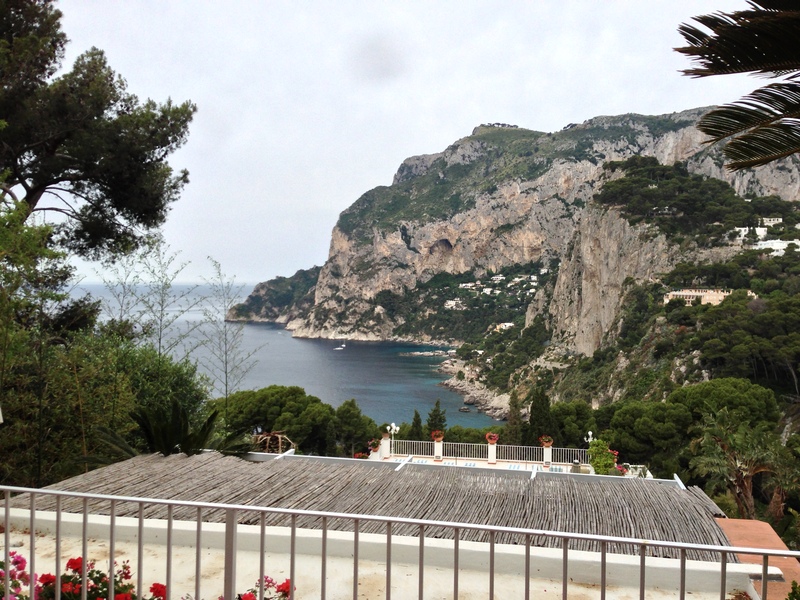 The address is Via Tragara 24, 80073 Capri, Island of Capri, Italy. 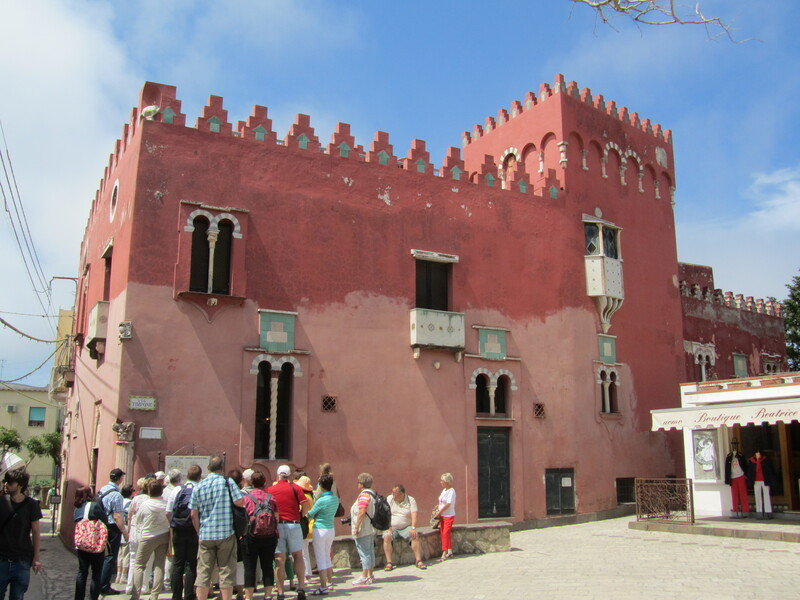 It is built on the side of a hill overlooking the small marina. All the rooms are on top of each other going down the hill. You have the entire level to yourself. The views are breathtaking. The rooms at the top are the best. We had room # 54 which the owner proclaimed to be the best in the hotel. Our room had an outdoor balcony overlooking the pool and the sea. The room was a suite with a living room, bedroom and large bathroom. You wake up in bed looking out a glass wall at the sea and a mountain overlooking the small marina. 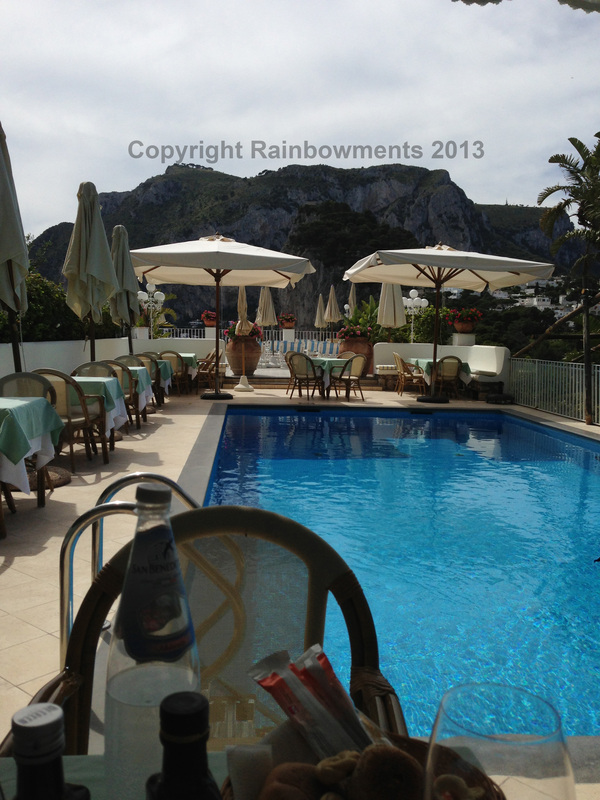 We had breakfast each day on our patio enjoying the weather and views. The owner and staff are fabulous. You do have to be in shape since our room was a good 75 steps down from the street and we were one of the top rooms. Live like a King & Queen and enjoy your stay. It will cost you but then you can’t put a cost on true romance, adventure and magic! This hotel is only gotten to on foot. Long winding ways lead you to the opposite side of the Island from the ferry marina. Don’t worry, porters will take your luggage at the ferry and deliver it safely to your hotel.